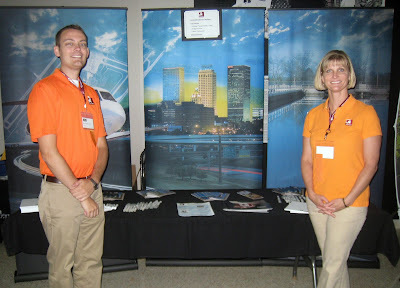 Tulsa transportation engineers Jenny Sallee and Michael Winterscheidt recently visited their alma mater to participate in the Oklahoma State University College of Engineering Architecture and Technology career fair. Many students stopped by the Garver booth, and we received resumes from students in various engineering fields, including civil, electrical, environmental, and construction management technology. "Career fairs are always an exciting way to keep in touch with the young engineering community. They're the future of our industry," Sallee said. Our Tulsa and Norman offices are a great place for young engineers to discover their niche in the industry and for experienced professionals to advance their careers. Our offices are growing and need quality engineers; the Tulsa Business Journal listed our Tulsa office as a Top Place to Work; and Garver's education reimbursement program helps engineers achieve higher education degrees. For more information on Garver job opportunities, visit our Website.